While smoking at my car at work (I work on a military base) A beautiful Defnder 90 diesel, strolls up and parks next to me. I waited for the driver to get out so I can hound him for info (who, what, where, how) he was just as excited as I was to let me take a picture and post it here on good ol' oppo. I asked where and how he got it and since he was military, I figured it was just a treasure brought along from a deployment... but no. He told me he bought it locally from a british service member who imports them and sells them here. 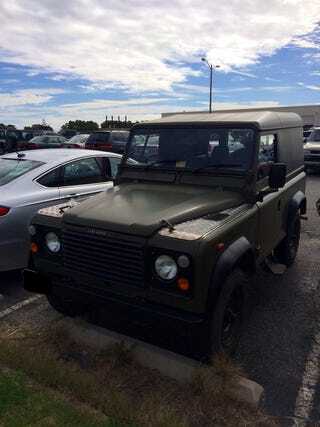 It's not the first defender I've seen here in Virginia Beach, there's a 110 for sale near my house and I see a guy driving a late 90's yellow soft top every one in awhile. I love this example for the lack of rear side windows, the military grade paint finish, that its RHD AND its a freakin' oil burner, sounds so damn good puttering down the parking lot. Kudos to the owner for being an opponut and being unique. I invited him to the website and the post, I hope he becomes one of us.